"to be a connoisseur there must be variety." THOUGH THERE ARE TIMES WE RUN OUT, WE DO OUR BEST TO KEEP THESE STOCKED ALL OF THE TIME. A MEAD OF SUBTLETY AND WONDEROUS COMPLEXITIES. THIS MEAD IS MADE WITH WILLAMETTE HOPS, WHOLE PLUMP BLUEBERRIES, MAPLE SYRUP AND HONEY. THE HOPS IN THIS MEAD BRING FORWARD A FRESH CITRUS NOTE THAT HELPS BALANCE THE SWEETNESS OF THE MAPLE SYRUP AND HONEY. THE WHOLE LOCAL BLUEBERRIES CONTRIBUTE A WONDERFUL PURPLE COLOR AND ALSO TANNINS FROM THEIRS SKINS; MAKING THIS MEAD MORE WINE LIKE THAN MOST OF OUR MEADS. DEEP, ROBUST, CREAMY, BALANCED. THESE ARE ONLY A FEW OF THE WORDS EXCLAIMED WHEN TASTED FOR THE FIRST TIME. MADE FROM THE FINEST WHOLE FAIR TRADE / ORGANIC INDIAN VANILLA BEANS AND LOCAL WILDFLOWER HONEY, THIS MEAD IS FULL BODIED AND REMINISCENT OF CREAM SODA. OUR VANILLA BEAN MEAD IS A TOUCH SWEETER THAN THE OTHER MEADS WE MAKE AND IT IS ALSO 18% ABV! HAVING SUCH A ROBUST FLAVOR, THIS MEAD MAKES A VERY UNIQUE COCKTAIL MIXER! A MILLION FLOWERS FROM ALL CORNERS OF NORTHERN NEW ENGLAND BROUGHT TOGETHER BY A MILLION BEES AND GIVEN TO YOU. THIS IS A DRY MEAD FOR SURE, BUT HAS A SUPPLE HONEY SWEETNESS THAT CANNOT BE MISSED. 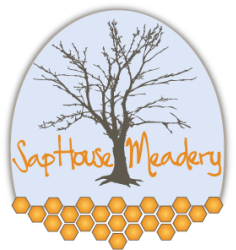 THIS MEAD IS GREAT FOR THE PEOPLE THAT THINK MEAD HAS TO BE SWEET AND WANTS TO BE PLEASANTLY SURPRISED! 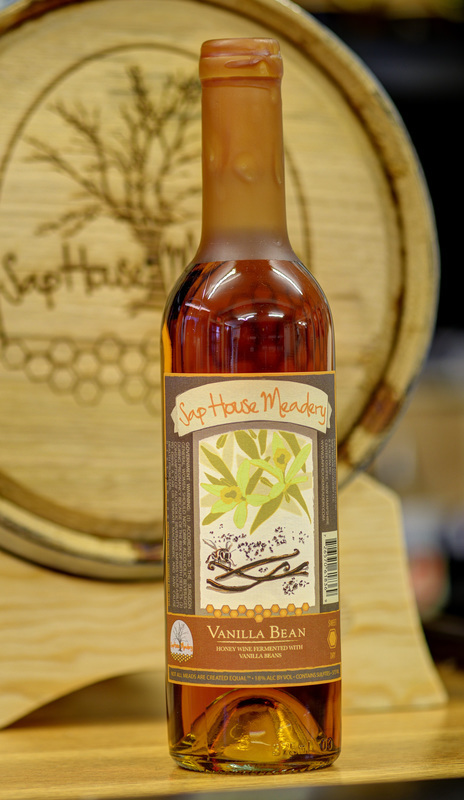 A BLEND OF LOCAL MAPLE SYRUP AND HONEY MAKE UP THIS SAVORY MEAD. BEING MADE OF TWO FO THE SWEETEST SUGARS AROUND, YOU IMMEDIATELY THINK SWEET. BUT SURPRISINGLY AND AND ALMOST UNBELIEVABLY, IT IS NOT! HINTS OF CARAMEL, APPLE CIDER, HONEY AND A LIGHT MAPLE WILL CARRY YOU THROUGH A BOTTLE OF THIS MEAD. YOU WILL QUICKLY SEE WHY THIS MEAD IS AWARD WINNING. MEADS THAT GRACE OUR SHELVES PERIODICALLY. TEMPRANILLO GRAPES FROM THE RIOJA REGION OF SPAIN BLENDED WITH LOCAL WILDFLOWER HONEY. THIS MEAD IS VERY SIMILAR TO A RED WINE - BUT SOFT AND VELVETY ON THE FINISH. 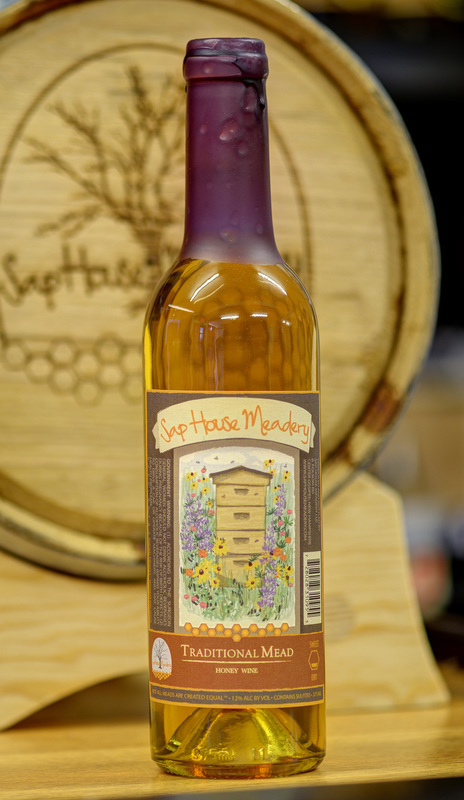 THIS MEAD IS A 2-TIME GOLD MEDAL WINNER AT THE FINGER LAKES INTERNATIONAL WINE COMPETITION. HARD TO PRONOUNCE BUT VERY EASY TO DRINK. AMARO GAYO (GUY-O) IS MADE FROM THE FINEST FAIR TRADE ETHIOPIAN AMARO GAYO COFFEE BEANS. THE PLANTATION THAT THESE BEANS ARE FROM IS WOMAN OWNED, WOMAN RUN! THE BEANS WERE ROASTED AT CQ COFFEE ROASTERS IN BEDFORD, NH WITH ARTFUL DELICATENESS AND INTENSE LOVE. FLAVOR BOMBS OF BLUEBERRY AND RASPBERRY NOTES, HINTS OF EARTHINESS AND JUST THE RIGHT TOUCH OF HONEY MAKE THIS MEAD EASY TO LOVE! LOTS OF WILDFLOWER HONEY AND LOADS OF LOCALLY PICKED BLACKBERRIES HELP MAKE THIS MEAD A FRUITY, LIGHTLY TART 18% ABV POWERHOUSE- BUT, YOU WOULDN'T KNOW IT TO BE HIGH IN ALCOHOL. A CHALLENGING ART IN MEAD MAKING IS FINDING THE PERFECT BALANCE OF SWEETNESS, ACIDITY AND ALCOHOL. ONE OF THE VERY FIRST MEADS WE MADE HERE AT SAP HOUSE. FRESH LOCAL PEACHES LITERALLY WANTING TO FALL OFF THE TREE, LOCAL WILDFLOWER HONEY AND GRADE B DARK MAPLE SYRUP ARE WHAT MAKE THIS MEAD A FAN FAVORITE. IT HAS THE CHARACTERISTICS OF A SWEETER PINOT GRIGIO BUT WITHOUT THE GRAPES! A DRY MEAD WITH AMAZING FLORAL UNDERTONES. OUR STRAWBERRY MEAD IS PROUDLY MADE WITH SHARTNER FARM STRAWBERRIES OUT OF NORTH CONWAY, NH AND LOCAL WILDFLOWER HONEY. THERE IS 1/4 LB OF STRAWBERRIES IN EVERY BOTTLE MAKING THIS ONE THE MOST ENJOYABLE MEADS ON THE MARKET. THE STRAWBERRIES BRING AN AMAZINGLY DEEP JAMINESS, A VIBRANT TARTNESS THAT IS BALANCED VERY WELL WITH THE SWEETNESS OF THE HONEY. A DRY MEAD WITH A MEDIUM-PLUS BODY, AND AN ATTITUDE THAT WILL MAKE YOU POUR THE WHOLE BOTTLE IN YOUR GLASS; BUT PLEASE, SHARE. A MAD MAN? AN ECCENTRIC? A CHARACTER FOR SURE! COWBOY NUTE HAS BECOME A LEGEND IN OUR LITTLE TOWN. SAP HOUSE MEADERY HAS JUST RELEASED A NEW PRODUCT LINE TO PAY HOMAGE TO THE MAN KNOWN TO SHOOT HIS SIX SHOOTERS WHILE RIDING A HORSE ON MAIN STREET BACK IN THE 1930'S. TO FIND OUT MORE CHECK OUT THE COWBOY NUTE WEBSITE FOR MORE INFORMATION! MADE WITH LOCAL MAPLE SYRUP, LOCAL HONEY AND ORGANIC LEMONS. LOOKING FOR A NEW TYPE OF SUMMER REFRESHMENT? YOU FOUND IT HERE. SERVED COLD OR OVER ICE, THIS IS THE REFRESHMENT YOU DESERVE. MADE WITH LOCAL APPLE CIDER AND WILDFLOWER HONEY. THIS IS A TRUE SEMI-SWEET CIDER THAT IS REFRESHING, EASY DRINKING AND MAKES THOSE FLANNEL SHIRTS JUST A LITTLE MORE COZY. MADE WITH LOCAL NH APPLE CIDER! FERMENTED IN THE EUROPEAN STYLE OF CIDER MAKING: WILD! THIS CIDER HAS AN AMAZING TARTNESS FROM THE APPLES AND A FUNKY SOURNESS FROM THE WILD YEAST FROM THE PRESS. A VERY UNIQUE CIDER THAT IS LOADED WITH THE FLAVOR OF THE FARM!